I have tried different formulas for controlling blood sugar with type 2 diabetes. Blood Sugar with Gymnena and GTF Chromium by Nature's Way works so far much better than others. Is much stronger and you will know for sure if you take it right before sleep because it will keep you awake. Blood Sugar with Gymnema and GTF Chromium by Nature's Way is great and very complete. My husband had only 8 capsules left, when I ordered Blood Suger with Gymnema and GTF Chromium by Nature's Way. I got the product delivered within a couple of days before he ran out. This product is great! Blood Sugar with Gymnema and GTF Chromium - 90 Capsules from Nature’s Way® might be useful for promoting blood sugar metabolism. Chromium present in the supplement could help improve blood sugar control. Chromium might also help with reducing body fat and building muscles. This supplement also contains cinnamon‚ which studies show to be useful for controlling blood sugar levels. The vitamin A present here could benefit vision and improve immunity. This supplement from Nature’s Way® also has gymnema‚ a substance that could reduce the absorption of sugar from the intestine. It could also help increase the amount of insulin the body and thus help control blood sugar levels. Fenugreek‚ nopal‚ bilberry‚ and bitter melon are all known to support healthy blood sugar levels in the body. The bilberry leaf may also improve circulation. This product should not be taken on an empty stomach‚ if you are pregnant‚ or lactating. Please consult your physician‚ before taking the supplement‚ if you use hypoglycemic drugs. It is important to maintain healthy blood sugar levels in the body and Blood Sugar with Gymnema and GTF Chromium - 90 Capsules from Nature’s Way® might be able to help. Other Ingredients: Plant-derived capsule (hypromellose)‚ cellulose‚ magnesium stearate. Contains no sugar‚ salt‚ yeast‚ soy‚ dairy products‚ artificial colors‚ flavors‚ or preservatives. Do not use this product if pregnant‚ nursing‚ or if you are attempting to become pregnant. People with diabetes should monitor blood glucose levels regularity. I needed Blood Sugar Metabolism Blend by Nature's Way to stabilize blood sugar levels, and I liked that it came with GTF chromium. It did work, and it did indeed lower my blood sugar as well as my cravings for sweets. Effectiveness: I love how it combined many ingredients for blood sugar control, and the affordability. Too many pills to take at once. 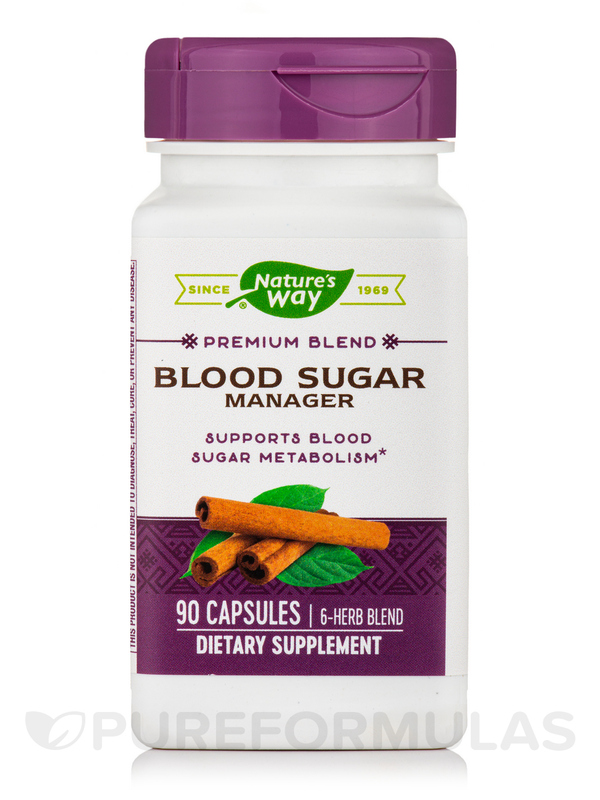 Blood Sugar Metabolism Blend by Nature's Way has assisted me in controlling my glucose levels naturally. I really am glad I found this product. I am amazed at the fast service I have received from PureFormulas since November of 2015. Blood Sugar with Gymnema and GTF Chromium by Nature's Way helps keep my blood sugar levels where they need to be; is a good diabetes precautionary measure. Easy to take; no prescription necessary; found in drug stores. Very affordable, and it works! Far better than Vitacost's formula. Is very effective specially when eating lots of carbs and I notice some weight lost too. Nothing, I just don't take all three caps if I am going to bed maybe one if I am going to sleep. I tried Nature's Way when my local store was out of their blood sugar support formula. Blood Sugar with Gymnema and GTF Chromium by Nature's Way was much more effective and has a much better price. I'm sticking with this one! Effective. Ease of use. Tablet size. Price. Quality. It works. Blood sugar is better controlled than oral meds. Blood Sugar with Gymnema helps with high spikes and balances energy. I am a diabetic taking 500 mg of metformin 2x a day. Would I benefit from taking this product (blood sugar with Gymnema) without any negative effects along with the metformin? I test my blood sugar daily, and my numbers have been slowly getting higher (daily testing avg ~ 140, and A1c was 6.7 last testing, was previously 6.0-6.2). Please advise.